This still from a NASA video shows an apparent smiley face on the sun as seen by the Solar Dynamics Observatory. 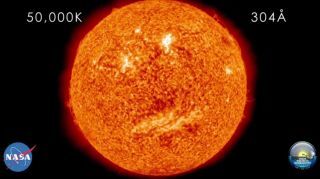 The solar happy face is seen in different wavelengths in a video posted on July 25, 2011. Our sun is apparently a happy star according to the latest video from a NASA observatory. The video shows a pattern of sunspots that, when viewed from afar, forms a vast happy face smiling across face of the sun. Sunspots are darker, cooler patches on the sun caused when intense magnetic activity blocks heat convection. These spots are normal, but they don't usually align to give the sun's face such character. These different temperatures correspond to different layers of the sun's atmosphere, starting with the sun's surface and gradually moving out to the sun's upper corona. Magnetic activity on the sun generally follows an 11-year cycle of waxing and waning. At the moment solar activity is coming out of a lull and starting to heat up, moving toward an expected peak around 2013.